To translate the content of an archival description, authority record, archival institution, or term, a user with translation privileges will open the translate user interface dialog and work within it. Log in with an account that has translation privileges. For more information, see: User roles, Manage user accounts and user groups, and Edit permissions. Start in your default language (e.g., English). Navigate to the content you want to translate into another language (e.g., archival description). For more information on navigation in AtoM, see: Access content. 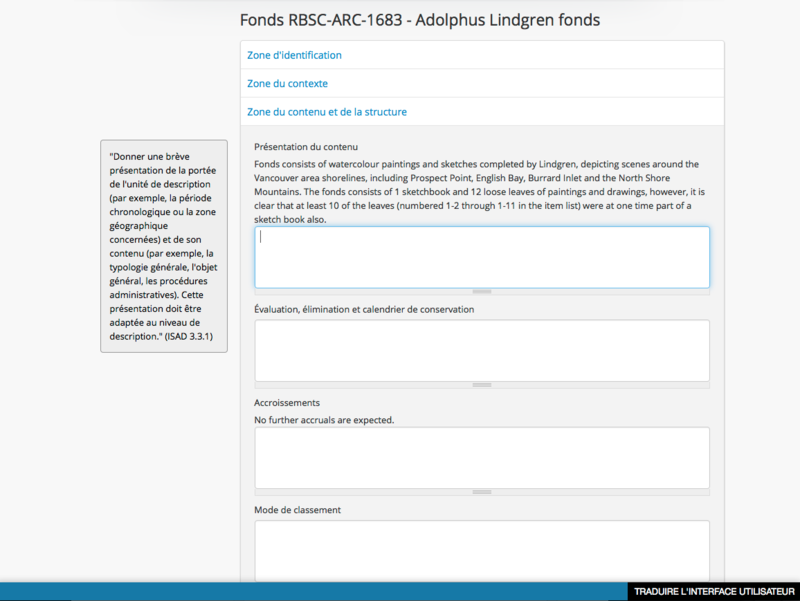 In the above example, the language selected for translation is French and the user is translating content in an archival description. Note the translation bar is visible at the bottom of the page. Ignore it for now. Begin translating the content of the archival description in edit mode by selecting one of the information area and typing into the data entry fields. Note that the content is shown in the source language above the data entry field. The tooltips (e.g., ISAD) will be shown in the new language because they have been translated as part of the AtoM application using Transifex instructions. Repeat for each field as required. AtoM returns the user to the view mode. The translated fields will now appear in the new language of translation. Any content not yet translated will continue to appear in the source language.